For those of you who are experts in baking bread, this may not be much to be proud of. But for me who grew up with rice and noodles, baking bread is a mystery. My experience has been hit and miss. I don't know how many times I threw away a flat ball of dough because it didn't rise. After such an experience, I usually shy away from trying for a while. Then, I bought an automatic bread machine so I wouldn't fail. But it turns out that I don't like breads baked in a machine. So far, I have used my machine to make the dough and let it rise only ('dough' cycle). It works pretty well and I have never failed in baking bread since. However, this time, the recipe for this bread is too big for my bread machine and I didn't want to cut it in half. I wanted to bake 2 loaves and freeze one. To tell you the truth, I was challenged to do it the traditional way like a real baker. Of course, I cheated and had help from my Kitchen Aid mixer to knead the dough. I was not so industrious to knead the dough with my own hands. Are you kidding? Look what I did! I pat myself on the back for successfully baking such really nice looking loaves. Naturally I have to blog it and show off! I have always loved dark colored breads with molasses such as squaw or pumpernickel. It is hard to find them in bakeries and I don't know why. Maybe because they are a bit sweet and people just don't buy them. I like my bread a little bit sweet and this must be an Asian thing. I searched the Internet for a recipe and found one but it is not vegan since it uses honey, milk powder and butter. It was easy to veganize it; though, I love the result without missing the butter, honey, or milk powder. I used half maple syrup and half molasses to replace the honey. Next time, I want to use all molasses since I like it a bit darker. I also thought that it was too sweet and will reduce the brown sugar. For brushing the top, I used a cornstarch glaze which was Bryanna's idea, posted a while back in her newsletter. Instead of using egg whites, I used water and cornstarch, cooked until thickened and cooled. Then, I brushed the top of the unbaked loaves with this mixture to give the top a 'shine' and to allow the toppings (like rolled oats) to stick to the bread while it is baking. I baked one with rolled oats topping and one without. We have eaten this bread as is, warmed in the oven, and topped with Earth Balance. 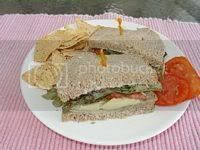 We have also used it as a sandwich bread and pictured below is 'Turkey' Avocado Cranberry sandwich I prepared. I used Tofurky Deli Slices Hickory Smoked 'Turkey' (my favorite), Organic Reed Avocado slices, Organic No-Sugar Cranberry Sauce (store bought), Vegenaise, fresh tomato slices from our garden, and lettuce leaves. I love the combination of cranberry sauce, seitan turkey, vegan mayonnaise, home grown tomato slices, and squaw bread. Adapted from a recipe I got from the Internet, I veganized this bread and turned out to be really good. Instead of honey, I use maple syrup or molasses. The brown sugar, raisins, and maple syrup gives sweetness to rye-whole-wheat grain bread. This bread is yummy for a sandwich or just with a dab of Earth Balance. 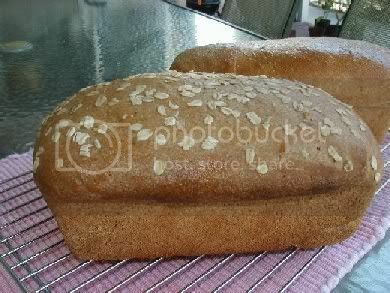 This bread is a bit sweet and you can reduce the brown sugar if you like to reduce the sweetness. Combine water, oil, molasses or maple syrup, raisins, and 4 tablespoons brown sugar in a blender. Liquify. Soften yeast in warm water with remaining 1 tablespoon brown sugar. Let the yeast dissolved in warm water for 5 minutes. In a large bowl sift together all the flours. salt, and soy milk powder. Place molasses or maple syrup mixture and yeast mixture in a mixer bowl. Add half of the flour mixture. Beat with dough hook of your mixer. Gradually stir in the remaining flours to make soft dough that pulls away from the sides of the bowl. Let it knead for about 10 minutes. See tip. Place dough in lightly greased bowl and turn to grease surface. Cover and let rise until double (about 1 1/2 hours). Punch down and let it rest 10 minutes. Divide into 2 loaves and place into 2 lightly greased 9" by 5" bread loaf pans OR divide into 4 round loaves and placed on greased cookie sheets sprinkled with cornmeal. Cover and let it rise in warm place until doubled (about 1 hour). Prepare topping: heat 1/2 cup water with cornstarch, mix well, and let it simmer till thickened. Let this mixture cool. 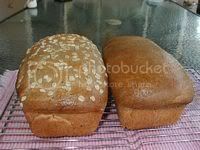 Just before baking, brush both loaves with the cornstarch mixture and sprinkled with rolled oats on top. Bake in a preheated 375 F oven for 30-35 minutes. Brush with melted Earth Balance and cool on racks. Nutrition (per serving): 142.0 calories; 18% calories from fat; 2.9g total fat; 0.0mg cholesterol; 155.8mg sodium; 109.5mg potassium; 25.8g carbohydrates; 1.5g fiber; 4.5g sugar; 24.3g net carbs; 3.0g protein; 2.8 points. Cooking TipsI could not use my bread machine to knead the dough since this recipe is too big for it. You can cut the recipe in half to knead it in your bread machine. I kneaded the dough in my Kitchen-Aid Heavy Duty mixer. This mixer almost could not do the job to knead dough for 2 loaves of bread. I was afraid that it would start to smoke but fortunately it didn't. I wish I have a Bosch mixer. Oh well! Congratlations! Isn't it gratifying having homemade bread come out of your oven?! I have been secretly visiting your blog (not leaving a comment) for a while now and I have to admit I want you to be my teacher (or eat at your place) ! Everything you make is incredible. I so wish I could cook like you do ! You are incredible. But that bread, I feel I could try that and not mess it up. So I will. Like you I love pumpernickle bread and can never find it where I live and when I find it elsewhere, it is never good, very low quality. So thank you for posting your recipe ! And I will let you know how it turns out ! Congratulations on your beautiful bread Spice Island Vegan! You must have read my mind because I have been thinking about making some nice hearty yummy bread. Now I'll have to give your bread a try. Yes, it is gratifying to bake a homemade bread. They are better than store bought for sure. Gaia, thanks for your comment and praises. It boosted up my ego...ha ha... I know some of my readers don't leave comments and that's ok. I call them phantom readers...ha ha.... I have several fans who read my blog without leaving comments. Some of them are friends and family and some are people out there. I tagged you for it. No I didn't know I was tagged by you and didn't see the comment. I will write then. Thanks for tagging me. The 5 foods I will put down will be unusual..ha ha...since I grew up in a spice island and ate different kind of food that most people haven't tried. Congratulations the loaves look wonderful so I am sure they taste just as good. Even though I grew up with bread I have had some awful disasters with dough that wouldn't rise. You could have fooled me; this bread looks as if you bake your daily bread. It invites you to take a big slice and eat it. Interesting post you got here. It would be great to read something more about this theme. Thanx for sharing this material. I've never thought this squaw bread even though I always eat this bread at cheesecake factory restaurant. Buddha's 'Mock Peking Duck' or Mu Shu Tofu?